I love to make things and one of my big loves is reusing something to make something new. I try to reuse as much as I can in my craft projects. In a way I guess that makes me a fixer of sorts. If like me you are creative and enjoy fixing things then this is for you! I am delighted to be teaming up with Sugru, the company that made the world's first mouldable glue! Genius right? They have recently worked with some great animation experts to bring their Fixer's Manifesto a new lease on life! The finished product is lovely and quirky don't you think? few in my daily life. I am sure they apply to many of us and are certainly something I want to teach both D and Baby S throughout their lives. We are teaming up to giveaway a Limited Edition Print of The Fixer's Manual! You can enter below using the Gleam widget. Sugru is the sponsor of this giveaway and is responsible for prize fulfillment. If it's not broken improve it. I'm a great believer in maintaining things and keeping them in tip top condition. If its not broken, leave it alone!!! great manual - love the idea of fixing is good. Embrace the stuff we have. Broken things are always worth fixing. 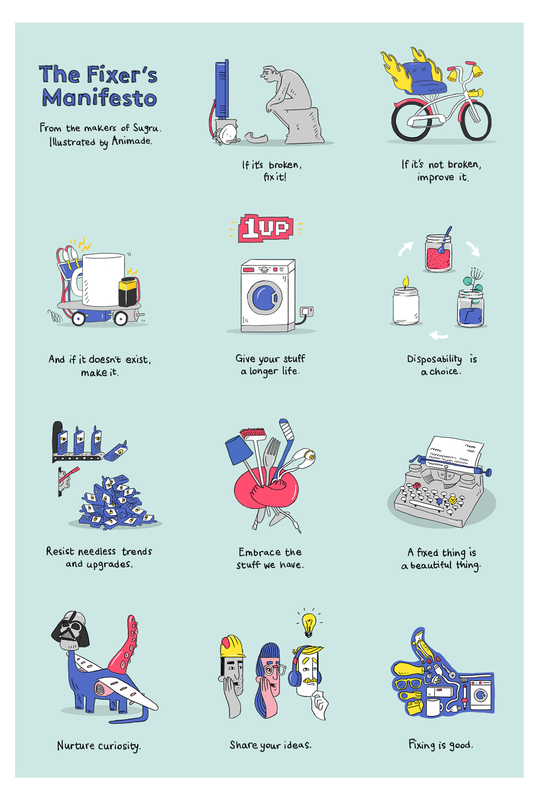 My favourite is "Give your stuff a longer life".